Currently, the mammological collection of the National University of Uzbekistan is comprised of 2676 specimens of 125 species belonging to 23 families of 7 orders. 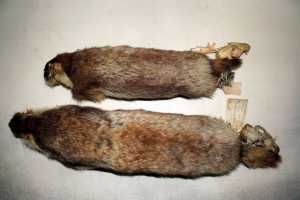 They include unique specimens belonging to the first descriptions of the nominative subspecies of Marmota menzbieri menzbieri (1924; 2 specimens); Selevinia betpakdalensis (1938, 1 specimen) and Allactaga bobrinskii (1936; 2 specimens). There are also individual specimens and series of 46 mammalian species outside the fauna of Uzbekistan, namely, from the Central-Asian-Kazakhstani region, West and East Europe and Siberia. The formation of the mammological collection as part of the zoological collection of the National University of Uzbekistan dates back to the early 20th century. More than the third part (34.5%) of all collection specimens were collected in 1930-1940, when the mammalian fauna of the Pamirs, western Tien Shan and the Kyzylkum desert were actively explored by R.N. Meklenburtsev, D.F. Zheleznyakov and I.I. Kolesnikov. In that period, the collections were expanded with mainly their efforts. Such well-known scientists as D.N. kashkarov, E.P. Korovin, A.P. Kuzyakin, T.Z. Zakhidov, V.P. Kostin, H.S. Salikhbaev also replenished the collection. Of significant interest is the series of skulls of the винторогого козла collected by G.S. Sultanov in Kugitang in 1939-1940. The following modern scientists (1980-90) made a significant contribution to the collection: R.D. Kashkarov, E.R. Fotteler and M.I. 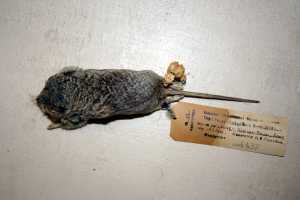 Pak, who provided 453 rodent specimens, which included series of skins and skulls of mouse-like rodents from the Chatkal Ridge and Nuratau, jerboas and tolai hare from the Kyzylkum desert, as well as relict ground squirrels from Gissar. 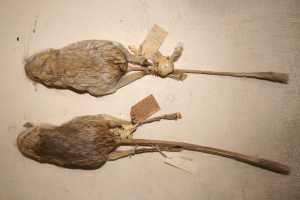 In 1987-88, the collections were replenished by a series of 294 skulls of muskrats collected by E.A. Peregontsev and O.P. Nazarov on Lake Aidarkul. The collection fund constitutes 81.7% of the total species diversity of mammalians in Uzbekistan. 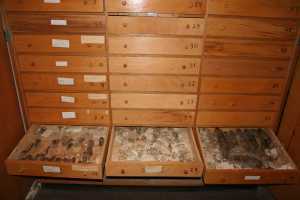 Of these, the most complete collections include the orders Insectivora (five species), Chiroptera (77,7 %) and Rodentia (85,7 %). Of 25 predator species inhabiting Uzbekistan, 14 species are available in the collection (56,0 %); of 10 ungulate species, only 5 (50%). This is quite attributable to the specifics and difficulties of collection and preparation of large mammalians. The most numerous in the mammological collection are specimens from the desert Kyzylkum (23.76% of all specimens) followed by collections from western Tien Shan (20.66%) and Pamir-Alay (18.53%). Tashkent province flat-land collections constitute 7.28% of all specimens. The fauna of the middle and lower courses of the River Syrdarya and Kopetdag is less diverse (5.97% and 5.01% of all specimens, respectively). The remaining 16 geographic districts constitute less than the fifth part of the entire collection (15.99%). Geographically unidentified specimens constitute 2.8% of the collection. The replenishment of the collection was most intensive in the first half of the 20th century. In 40 years (1919-1960) the collection was enriched with 1645 specimens (61,47% of the entire collection). From 1930 to 1940, the mammalian fauna of the Pamirs, western Tien Shan and the Desert Kyzylkum was explored by such outstanding scientists as R.N. Meklenburtsev, D.F. Zheleznyakov, I.I. Kolesnikov who replenished the collection with 924 specimens (34.52% of the entire collection). In the second half of the 20th century, the replenishment sharply dropped, which was mainly the result of a decrease in interest to faunistic studies and deterioration of funding. The only exception was the decade between 1981-1990, when the collection was replenished by series of rodent collections (807 specimens), which made up 30.15% of the entire amount of the collection. Not having an opportunity of an authentic identification of the species of genus Microtus, the modern species independence of which is based on the karyological analysis, the author leave their re-identification to those experts, who will work on this group in the future. Currently, the catalogue of the genus Microtus is comprised of those names that are included into the authors' labels. This is also attributed to the groups of species Meles meles, Mus musculus and Apodemus sylvaticus. Hence, inside Allactaga elater, which was previously thought to be monotypic, subspecies Allactaga vinogradovi was raised to the rank of a species. The mammological collection of the National University of Uzbekistan is situated at the same building as the ornithological collection of this university. 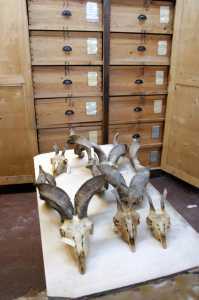 Small mammalians are stored in two wooden cabinets with drawers; the skulls and skin of predators and ungulates are stored in six boxes. All cabinets and boxes are numbered; the index of families kept in these boxes is on the front wall. The full card-index arranged in the alphabetic order is available in the office of the scientific group Ornithologist next to the collection premise. There is an electronic database in the computer of this scientific group. The ornithological and mammological collections represent a single collection fund of the Department of Zoology at the National University of Uzbekistan.